Celebrate April showers all year long with this sweet stoneware piece. Rain: Bad for hair, great for gardens. 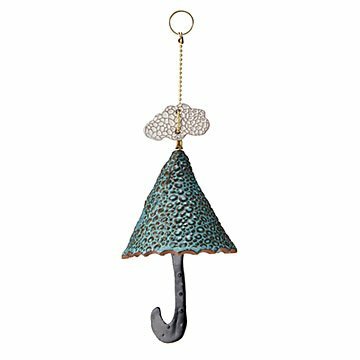 For this sweet bell designed by Jo-Ann and Gerald Warren, gentle raindrops dot a playful parasol, while a tiny rain cloud hovers above. It's crafted from stoneware that's weatherproof (Canadian winter tested— and approved), so display it in your backyard and celebrate April showers all year long. Dishwasher safe. Handcrafted by potters in Kingston, Ontario.